Baby’s care .Every new born babies are precious gift of god and their skin is so soft, gentle and beautiful that everyone desires to touch it. But this may harm your baby’s skin in many ways. The skin of a newborn baby is extremely sensitive. It is so susceptible and may cause several skin problems like dryness, eczema, acne and skin rashes so new baby needs a lot of skin care. While taking care of newborn baby skin, there are quite a few things to remember. Some steps to know about the best skin care you can provide for your baby. The most baby’s products are a reason for the development of bacterial infections in babies. All Parents should make sure that they keep their child away from harmful chemicals like hard soaps, lotions and anything that contains dyes and fragrances. Because these chemicals will decrease the bacteria and skin dryness, allergies and other infections. Select good oils and lotions. Oil massage is very relieving and effective for newborn babies, but some parents usually make mistakes in choosing the right baby oil. Some of the products like Herbal healing oils and lotions should be preferred over mineral oils, which can harm your baby’s skin. And also chamomile, olive oil, almond oil and aloe oils are best suited for babies. 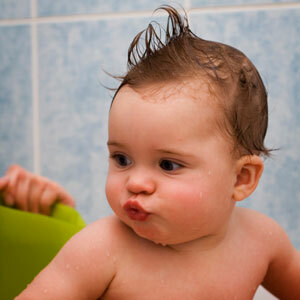 A newborn baby does not required daily bath. Too much soap and water can cause skin irritations and allergies, it is harmful advisable to only sponge bath your baby with lukewarm water twice or thrice a day. Always dry up the skin with a soft cloth to clean up any residue. In case of dryness, a baby moisturizer can be applied to maintain the natural moisture balance of the skin. Regularly baby’s clothing must be changed this would not allow dust to get in contact with your baby. And do not dress your baby in tight clothes.